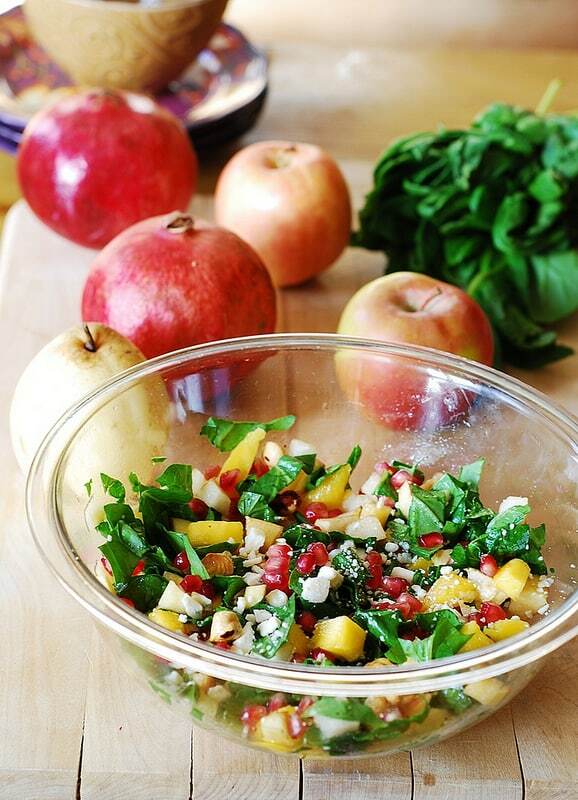 Chopped salad with spinach, pomegranate seeds, mango, apples, pears, hazelnuts and Gorgonzola cheese. Healthy, delicious recipe! I love pomegranate seeds and eat them pretty much as is, as a mid-day snack, but I also started looking for good recipes that call for actual pomegranate seeds. I just found and tested this one from Epicurious.com, and it is a keeper! 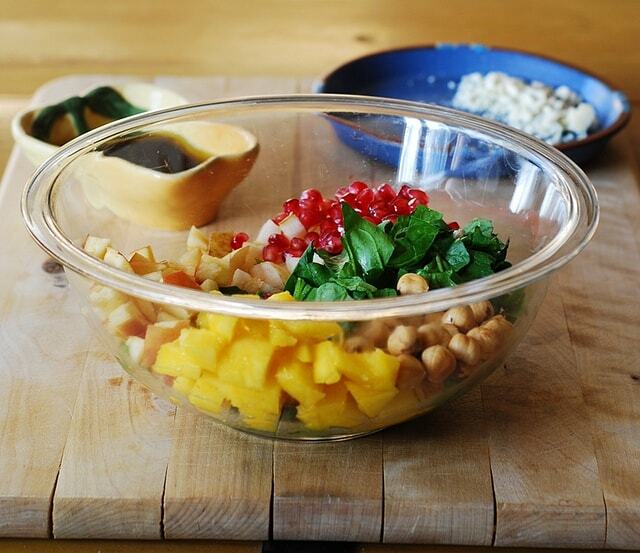 Everybody who tried this chopped salad with spinach, pomegranate seeds, mango, apples, pears, hazelnuts and Gorgonzola cheese so far has been in awe. And because it’s so colorful and festive and has lots of seasonal fruit (apples and pears) plus pomegranates and hazelnuts, I will be serving it this Christmas! This chopped salad is good on so many levels. First of all, the combination of flavors is out of this world! It’s fruity, tarty, crunchy, sweet and sour – all at the same time! It’s like a fruit salad, but with a big savory side coming from spinach and Gorgonzola cheese. Pomegranates with their unusual sweet-tart flavor add their own amazing dimension. Definitely serve it with the cheese – the Gorgonzola cheese to this salad is akin the icing to the cake. Second, this chopped spinach salad is very versatile. In place of spinach, you can use any other salad greens: baby greens, romaine hearts, Arugula. You don’t have to use Fuji apple – any sweet, firm apple will do. Same goes for Asian pear – use any firm pear (not overly ripe, you want pear slices to keep their nice square shape). I also found that you could actually eat this salad without dressing, especially if your salad has been refrigerated for several hours: the fruit from the salad produces juices and if you mix the refrigerated salad, you might decide not to use any dressing at all! Or you might use very little. Or a lot. Mix the salad and taste it and decide for yourself. I actually ate it without any dressing the next day, which makes the salad even healthier! Here are the changes I made to the original recipe on Epicurious.com. I used balsamic vinegar instead of red wine vinegar, because I like balsamic vinegar so much better in a salad dressing. I omitted shallots in the dressing, omitted red cabbage (don’t like either in a fruit salad) and decided not to coarsely chop hazelnuts but keep them whole, for more crunch. Also, instead of blue cheese, I am using Gorgonzola cheese, which in my experience is milder and suits salads much better than blue cheese. Note: When I made this salad, we ate only portion of it for lunch, and I placed the rest of the salad (without dressing) in the refrigerator. By dinner time, the juices from the fruit moistened the salad so well, I didn’t even have to use the dressing! It was great as is, without any dressing. So, if you plan to keep the portion of the salad refrigerated, mix the salad really well and taste it before adding salad dressing – it might not need any. 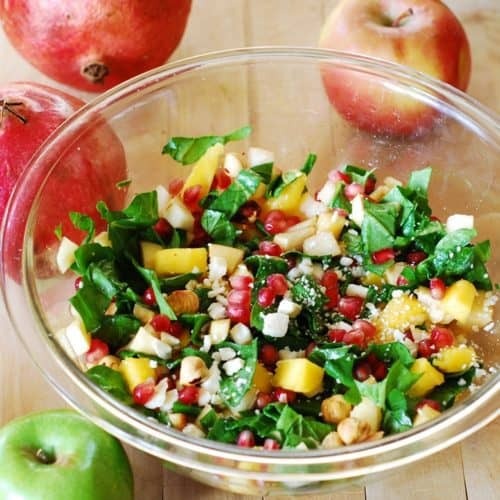 Delicious chopped salad with spinach, pomegranates, mango, apples, pears, and Gorgonzola cheese with an easy homemade balsamic salad dressing. 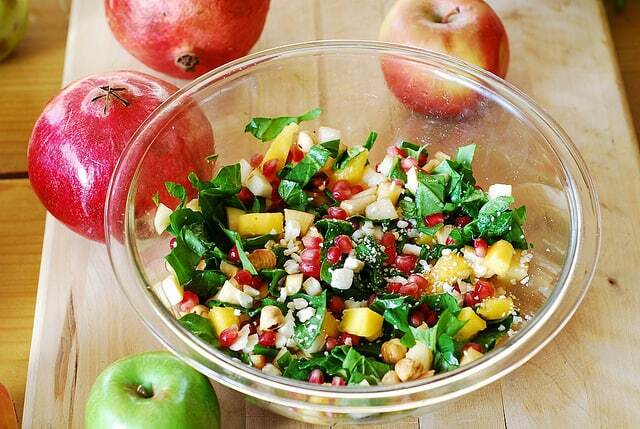 In a large salad bowl, combined chopped spinach, diced apple, dice pear, diced mango, hazelnuts, and pomegranate seeds. Mix ingredients well. To make salad dressing: in a separate small mixing bowl, mix vinegar with olive oil, honey, whisking until emulsified. Add dressing to the salad and toss until well mixed. Top with crumbled Gorgonzola cheese. 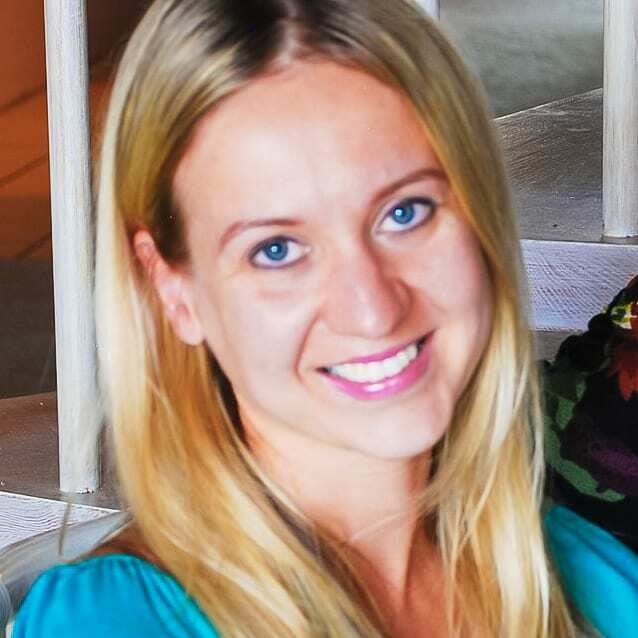 Participating in the Bookmarked Recipes Event hosted by Jacqueline from Tinned Tomatoes. 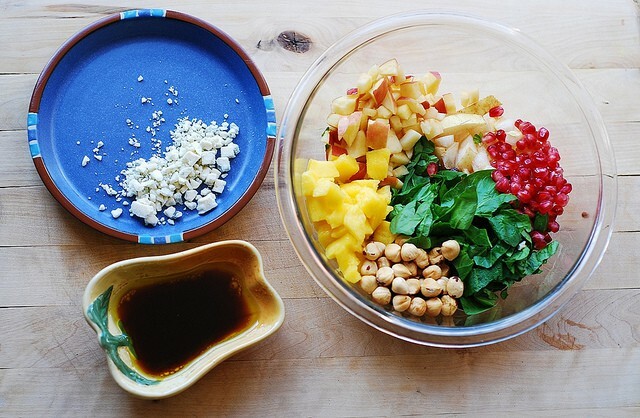 I love this salad so much; I’ve already made it at least 3 times and am eating while I type! As I chop the fruit I put the dice into a bowl with a juiced lemon and water. That helps keep the apple/pear from browning. I’ve been using candied pecans. Pomegranate seeds make this salad though; once Trader Joe’s didn’t have them and I used blueberries and it was a bit of a dud. It makes a great office lunch for about four days. Your website looks interesting! Can’t wait to try some of these recipes! Your sight looks really interesting! Can’t wait to try some of these recipes! Easy way to get pomegranate seeds out. Cut in half. place cut side down on cutting board. Bang on outside with something hard, mallet, etc.. Seeds come right out! That looks really fresh and delicious Julia. It isn’t flavours I have thought to put together in a salad before, but I can almost taste it looking at that mouth watering photo and it tastes good.